Terminal Bullets Male Insulated Vinyl Blue .156 TMR ST145 Bag of 100. 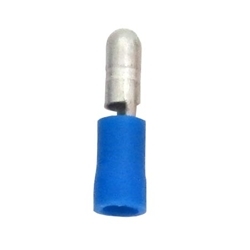 Vinyl bullet connectors are the most economical insulated bullet terminal connector available. The PVC insulation sleeve is securely fastened to the butted seam barrel.